It was quite entertaining interviewing Traditional Division band members at a recent Elk Mound Youth Rally. Since it is a rare youth event in the Diocese of LaCrosse these days that does not feature their sing-along, shout-along, dance-along Christian music, they are familiar faces and, to many teens, local heroes. Traditional Division's teasing, joking and enthusiastic hearts made for a somewhat rowdy interview but in the end, left me with a clear picture of six guys having a blast, doing what they enjoy most in life and rocking out for the Lord. There has been some big news for the band in the last several months. First, they added a member, Chris Rogers, on Batman guitar. You may know Chris as the Director for the Diocese of LaCrosse Office of Youth and Young Adult Ministry. Chris came to the area a few years ago from Nashville, TN and after a few jam sessions with the group they asked him to join. The other five members are from just two families. 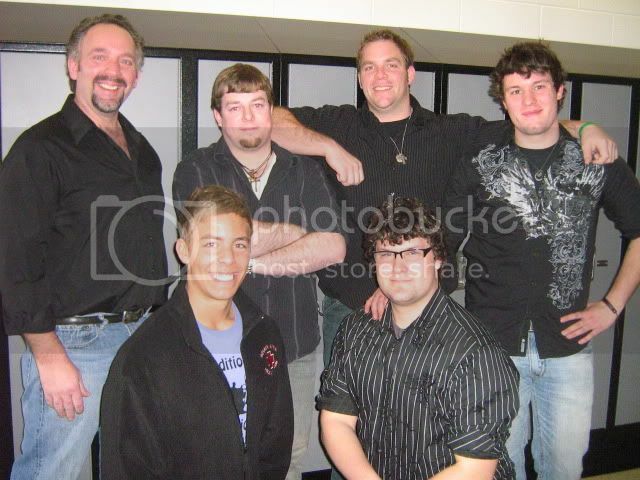 Pat Brueggen (drums), is the father of Andrew (bass guitar) and Sam (keyboard). The Kirchers, Jon (guitar) and Tyler (vocals and general mayhem), are brothers. Pat's early experiences with another band helped the group to form and be successful. Now it is he who keeps the guys focused and on track. I told them that when you google Traditional Division you get a lot of math coming up instead of a Christian rock band. Samuel was the only member particularly happy about that, being a guy with a major in industrial technology. At this time three of the six members are working in youth ministry. Pat at St. Elizabeth Ann Seton Church in Holmen, Andrew at St. Pat’s in Onalaska and Chris, for the Diocese. Sam, Tyler, Andrew and Jon are all college students. The other big Traditional Division news is their recent endorsement by now-Archbishop Listecki. When asked about the future, Andrew was looking forward to his upcoming marriage in 2011. Other than that the feeling was the same all around. They just want to keep doing what they are doing now. Jon shared how being in Traditional Division had really helped him and Tyler to move on with life after the death of their brother. Interview date: February 27, 2010. Thanks to Marko Boskovic for help with the video for the interview. For more Traditional Division videos, pictures and fun stuff including a discussion of Sam's Hair, click here.